The ‘Outreach Activities’ are research initiatives which were taken up by the Indian Council of Agricultural Research (ICAR) under the XI Five Years Plan. These projects were meant for focusing attention in certain key areas of research that cut across the mandates of more than one institute. These ‘Outreach Activities’ functioned in a Consortium mode, led by a ‘Lead Institute’ in active partnership with other ‘Participating Institutes’. 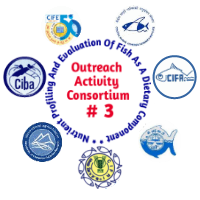 Three Outreach Activities (Consortium Projects)* were initiated by the Fisheries Division of ICAR. These are different from other projects; these are technically independent and spread over the participating institutes in consortium mode and are monitored by the Fisheries Division, ICAR. There is a Coordinator and Co-Coordinator to coordinate, implement, monitor and report the project activities. Fish is one of the cheapest sources of animal protein and is widely recognized as a health-food owing to its richness in essential amino acids, minerals and trace elements. Marine fishes are rich in fats and oil (PUFAs, polyunsaturated fatty acids). PUFAs, especially the omega-3 PUFAs, EPA and DHA, consumption has various health benefits. It helps in preventing cardio-vascular diseases (CVD) in adults, age-related macular degeneration (AMD), dementia and mood disorders in elderly population and attention-deficit hyperactivity disorder (ADHD) and childhood asthma in pediatric population. Small indigenous fishes (SIFs) are nutrient dense and help in preventing micronutrient deficiency. Low birth weight (LBW) and stunted growth are anthropological and social problems in the South- East Asian countries. Marine fish consumption has been reported to prevent the low birth weight problem. India has vast marine, brackish and fresh water resources and has a rich fish biodiversity. Nutrient compositions of fish vary with species, size and season as well as habitat and production systems. However, the nutrient compositions with respect to such variables have not been properly recorded. Hence, there is the need to document the nutrient profiles in terms of proximate composition, amino acids and fatty acids profiles, mineral and vitamin profiles for the common edible species available in the country. This would enable us in appreciating the true health value of fish and help in designing fish-based ‘dietary guidelines’ to combat preventable human diseases. Therefore, a nation-wide survey is envisaged to find out the fish availability, fish consumption rate and pattern in different sections of the society, especially in fishermen communities and coastal population to correlate the fish intake and low birth weight. A database will be generated with such information that would help the scientists, dieticians, food manufacturing companies, policy makers to take decision on profile. Therefore, a nation-wide survey is envisaged to find out the fish availability, fish consumption rate and pattern in different sections of the society, especially in fisherman communities and coastal population to correlate the fish intake and low birth weight. A database can also be generated with such information that would help the scientists, dieticians, food manufacturing companies, policy makers to take decision on manufacturing and valuation of fish food products and also for consumer guidance. This will also help in prioritization of species for commercial exploitation.